“Exclusion” is a multimedia installation using a poem I’ve written about being excluded laid out in a labyrinth pattern. 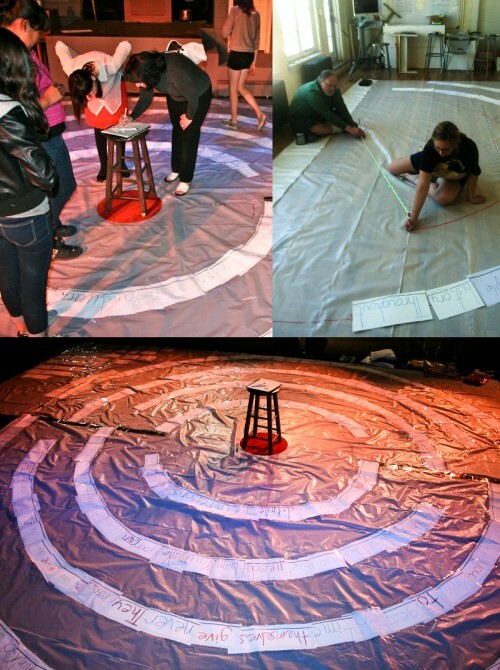 “Exclusion” is interactive, as it asks participants to walk the labyrinth following the poem. In the center a notebook with pencil is provided for participants to answer thought-provoking questions about how they too have been excluded. The accompanying stop-motion video reinforces the theme of exclusion, by exploring the emotional impact it has on the bullied, using non-threatening imagery.